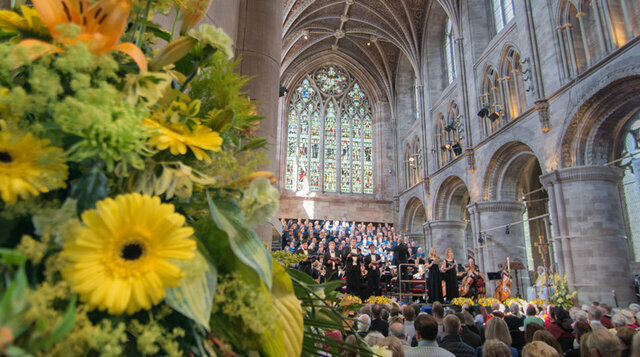 The Three Choirs Festival has begun in Hereford and is a week-long programme of choral and orchestral concerts, cathedral services, solo and chamber music recitals, masterclasses, talks, theatre, exhibitions and walks, rotating each summer between the beautiful English cathedral cities of Hereford, Gloucester and Worcester. It is the oldest non-competitive classical music festival in the world, which celebrated its 300th anniversary in 2015. At the heart of the modern festival are the large-scale evening concerts featuring the Three Choirs Festival Chorus and the Philharmonia Orchestra, which has been resident at the festival since 2012. The main festival’s packed schedule of daytime events is augmented by a community programme which varies slightly in style in each city. The Three Choirs Festival is run by dedicated voluntary committees in Hereford, Worcester and Gloucester, supported by a small professional management team based at the Three Choirs Festival Association’s office in Gloucester. The Three Choirs Festival, which was first held in 1715, is probably the oldest music festival in the world. The Festival is held in turn in one of the three cathedral cities of Gloucester, Hereford and Worcester. This year the Festival takes place between 28 July and 4 August and, by rotation, it will be hosted by the cathedral and city of Hereford.